Just showing off what we ate for dinner tonight really. It worked out better than I had planned, or rather didn’t plan. I have been salivating over the cover of the latest Sainsbury’s Magazine which shows a delicious looking meal of some salmon and asparagus. I’m so lazy that I haven’t been bothered to pick up the actual magazine to look a little closer or even glance at the recipe and so cheap that I won’t spend £1.60 on it. And so it came as no surprise to me that I had these grand plans of making ‘that recipe’ and yet no idea of what it actually contained. 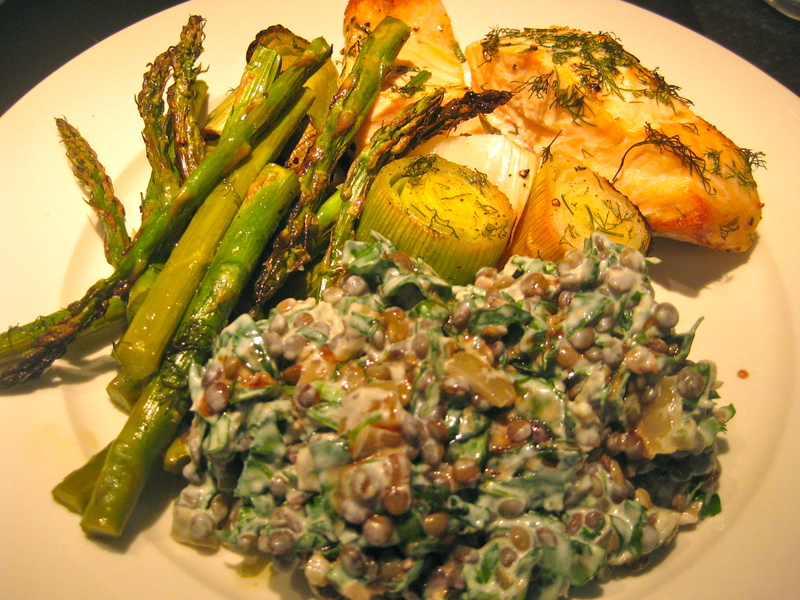 Of course I saw lemons, dill and asparagus and I bought those things with this meal in mind, but as the evening drew in, I didn’t know what to do. I had bought a leek. I like roasted leeks. I knew that salmon and herbs alone would not be enough to sustain my hefty frame but I couldn’t think of what else to serve with it. I lingered in the kitchen, opening and closing the fridge and then Ottolenghi came to mind. Lentils. I love lentils. So the meal was coming together now, it might turn out alright after all. I’ll post the lentil recipe tomorrow, but for tonight I’ll leave with you with a photo of my gourmet Tuesday night meal and a list of what I put in the tray. Some salmon fillets (or cutlets) skin down in a tray. Sprinkle with asparagus, inch portions of leek, a quartered lemon (that you’ve squeezed over the whole thing) and a healthy drizzle of olive oil, salt and pepper and of course a shower of roughly cut dill. I put it in an oven at 200C for about 20-30 minutes. 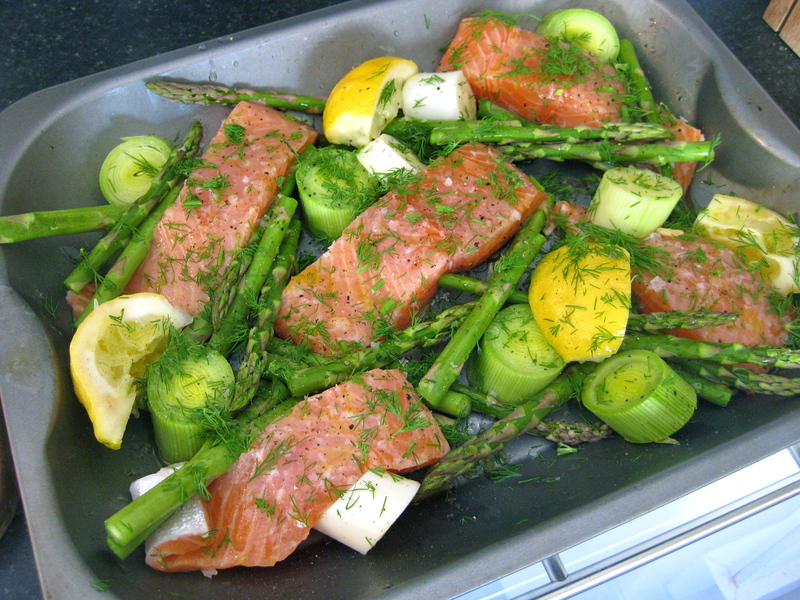 The leeks and asparagus tips were a little brown and crunchy but it tasted good and the salmon was perfectly cooked. I sound like a TV chef when they taste their food in front of you – without the possibility of verification – and tell you how great their meal is (subtext – how amazing THEY are). But seriously, this was pretty good and very easy to make AND if you choose your sides well – it can be a LOW GI Paleo approved meal.